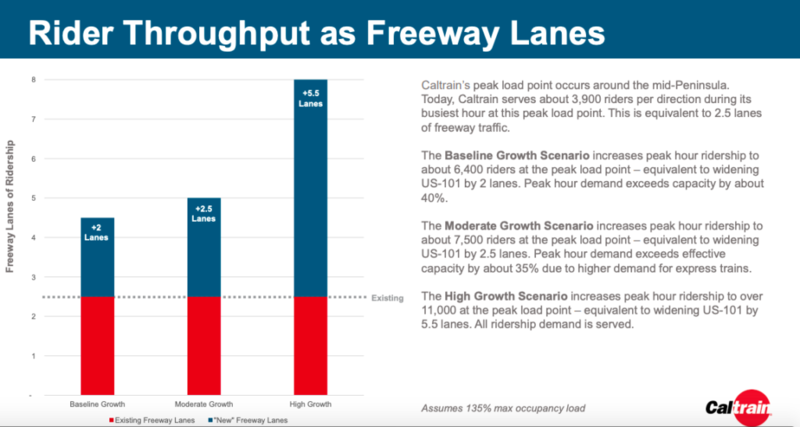 New data from Caltrain’s business plan analysis shows that the “high growth scenario” would provide equivalent capacity to 5.5 highway lanes in each direction. 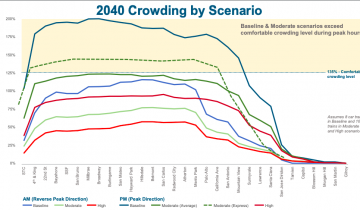 The “moderate growth” scenario would provide capacity equivalent to 2.5 highway lanes in each direction. Caltrain’s business plan analysis indicates that there is pent-up demand for the high growth scenario. 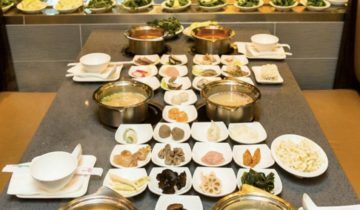 And the high-growth scenario would enable more frequent service, and more customer-friendly, regular service plans. But that scenario would require more passing tracks and passing stations. Do you think that Caltrain and corridor cities should continue to explore the higher growth options, even though that would require more passing infrastructure? As an engineer, I think the passing infrastructure and its feasibility (incl. costs) should be identified ….before making a business plan based on ts availability. Not in each direction. The lane totals include both directions. But “feasibility” is really just a NIMBY factor. Where value 1 if adjacent to wide RoW next to adjacent warehouse to 10 if constrained RoW next to SFH. Right? 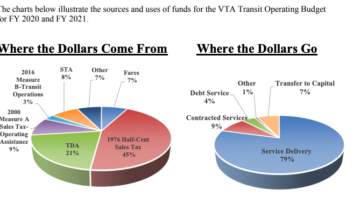 @Martin – Putting passing tracks by Downtown Mountain View (one of the options) is most likely not feasible because of VTA Light Rail. Nothing Nimby about this, there is no room. I agree that Mountain View is trickier, but there are no high-rises in the way, so it’s possible to move stuff around. On one side there’s a 4-lane expressway that happens to have third lane where we need space. On the other side, there’s Evelyn which turns from a 2-lane into a 4-lane road with a generous median. A lane or median can be reclaimed. In station area, there’s a parking lot that could be encroached and a garage built to preserve capacity. About the only thing in the way is a station replica that was built 20 years ago. But since it’s not historical, it could be moved or rebuilt. Still easier than buying a a few houses in Palo Alto. One thing should be made clear is that Mountain View can’t get those extra train stops without extra tracks. Wow, if only somebody had ever thought about Mountain View any time in the last couple decades. For sure nobody at Caltrain did or has yet to. PS VTA Tasman rail could be torn up and replaced by a bus every 30 minutes and service would improve.